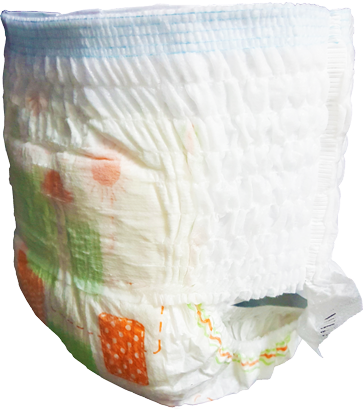 SJ Circle Sdn Bhd is diaper manufacturer in Malaysia and OEM disposable baby diaper pants manufacturer. We welcome you to become our partner in producing and selling the best quality of baby pants to our loved ones. SJ Circle prioritizes product quality in enhancing effective and efficient management system compliance with ISO 9001. We are responsive to provide good management practice to ensure hygienic production system. On top of standard baby pants features, SJ Circle took steps further to design extra and unique features which we have applied patents. Soft Waist Belt - 360˚ 3mm interval of multi-strand elastics to provide better hugging and comfort. 3D U-Channel - U-channel naturally for better distribution & diffusion of excess urine. Slim Curve-Elastic Back Skirt - Longer back & Shorter front skirt with Curve Shape that perfectly fit and hold baby’s buttock better.